Most people have both loose skin and areas of stubborn fat on their body that they would love to correct, but without an invasive body lift and surgical liposuction. BodyTite by InMode is a revolutionary, minimally invasive treatment that, when combined with liposuction, removes fat and tightens your skin with very little recovery time. The radiofrequency-assisted liposuction (RFAL) in BodyTite allows Plano, TX cosmetic surgeon Dr. Jeffrey Caruth to efficiently help his patients improve their body contours. When compared to SmartLipo, which stimulates the production of collagen to tighten skin over time, InMode BodyTite offers more immediate results. BodyTite is approved by the Food and Drug Administration (FDA) to tighten skin for fast, impressive results. Schedule a consultation at Plano Aesthetics to learn more about BodyTite. For the treatment of very small body areas including axilla bra fat, the upper arm, hands, and knees, InMode technology and Dr. Caruth are proud to offer AccuTite. This is a body contouring tool that uses radiofrequency energy to tighten the skin and contract the tissue underneath, offering smooth, dynamic results. Very similar to BodyTite, AccuTite can be used to treat small areas with incredible precision. BodyTite and AccuTite can help if you want to see better contours and skin tightness in one or several areas of your body. You may be a candidate for BodyTite if you want to eliminate stubborn pockets of fat and improve the appearance of sagging, wrinkled skin. You may have considered traditional liposuction or body lift surgery, but would prefer to avoid surgical downtime and scarring. Most areas of the body can be treated with BodyTite, but some of the more common areas patients want help with are the arms, chest, stomach, knees, and thighs. During your initial consultation, Dr. Caruth will listen to your needs and goals before helping you decide if BodyTite or another procedure is right for you. BodyTite and AccuTite are usually performed with local anesthesia, but IV anesthesia may be used if you are nervous or having several areas treated. The special BodyTite or AccuTite applicator is inserted through three-millimeter incisions in your skin. BodyTite has an internal and external thermometer, allowing Dr. Caruth to perform the procedure safely. The applicator will loosen and liquefy the fat with radiofrequency waves so the fat can be easily suctioned out of your body. The heat used during the fat removal will tighten your skin and connective tissue for immediate skin contraction. 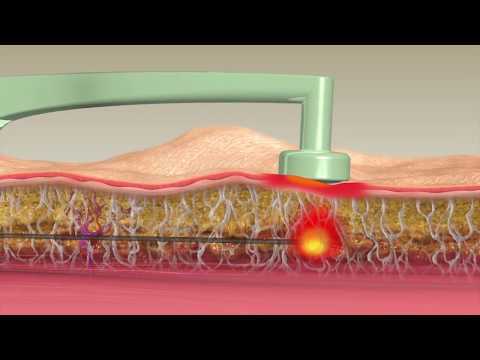 Treatments usually take about 30 – 45 minutes per area treated. You will need to rest at home for 2 – 3 days after your BodyTite treatment. A compression garment should be worn over the treated areas to promote healing while maintaining your new body shape. Some results will be seen immediately, but final results will not be apparent for 3 – 6 months as the swelling and inflammation subside. While the fat that is removed cannot return, the remaining fat cells can become larger if you gain weight, so it is important to maintain a healthy, stable weight after your BodyTite treatment. Your BodyTite procedure costs will depend on your overall aesthetic goals as well as the number of areas being addressed. During your initial consultation, Dr. Caruth will discuss your goals and concerns and use this information to develop a customized treatment plan. After a treatment plan has been created, your costs can be estimated. BodyTite is an ideal choice for men and women who want to contour their body while avoiding the long recovery times that can be associated with surgery. BodyTite produces stunning results, but cannot provide the drastic, long-term results that traditional lift procedures, such as tummy tucks, can. To help you make your decision, Dr. Caruth can help you understand all of your options during your consultation. Radiofrequency (RF) is an advanced energy source that utilizes electrical currents to create controlled heat. The controlled heat is used to target and destroy fat cells without disrupting the skin of the treatment area. Radiofrequency energy also helps promote collagen and elastin for tighter, healthier skin long term. BodyTite is an FDA-approved cosmetic procedure that is safe and effective for both women and men. The BodyTite procedure itself is very gentle, leaving most patients able to return to light activities very soon after treatment. InMode's BodyTite and AccuTite procedures are very similar in nature, offering stunning results. The primary difference between the two procedures is the size of the applicator. AccuTite is used on very small treatment areas for optimal precision while BodyTite can be used over large areas of the body. Dr. Caruth will determine whether BodyTite, AccuTite, or a combination of both will best help you achieve your aesthetic goals. Enjoy the benefits of skin tightening and body contouring in one simple BodyTite treatment by Dr. Caruth. Minimize your surgery and recovery time with radiofrequency-assisted liposuction to reveal the body shape you want. Learn more about minimally invasive BodyTite treatments during your consultation at Plano Aesthetics. Contact our office in Plano, TX to schedule an appointment with Dr. Caruth.